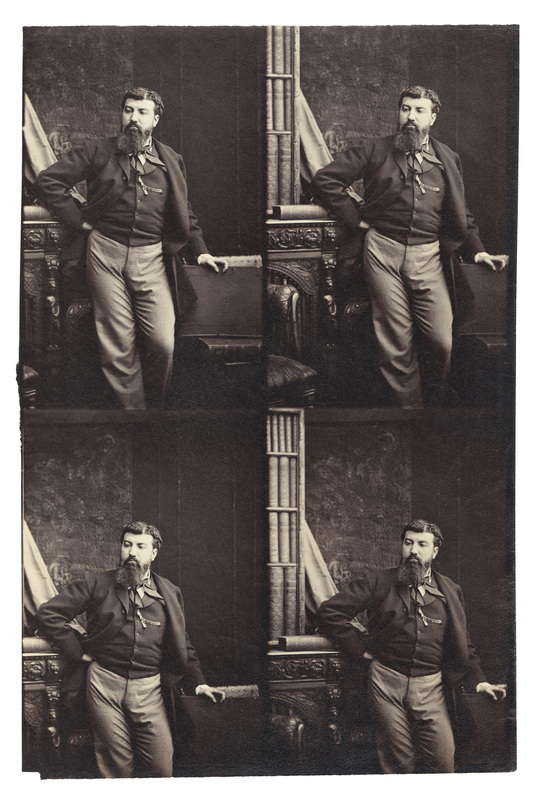 Camille Silvy – Frenchman, diplomat and war hero – yet only now is he receiving the recognition he deserves for his main achievement in life: as a brilliant and early pioneer of the portrait photograph in 19th century London. 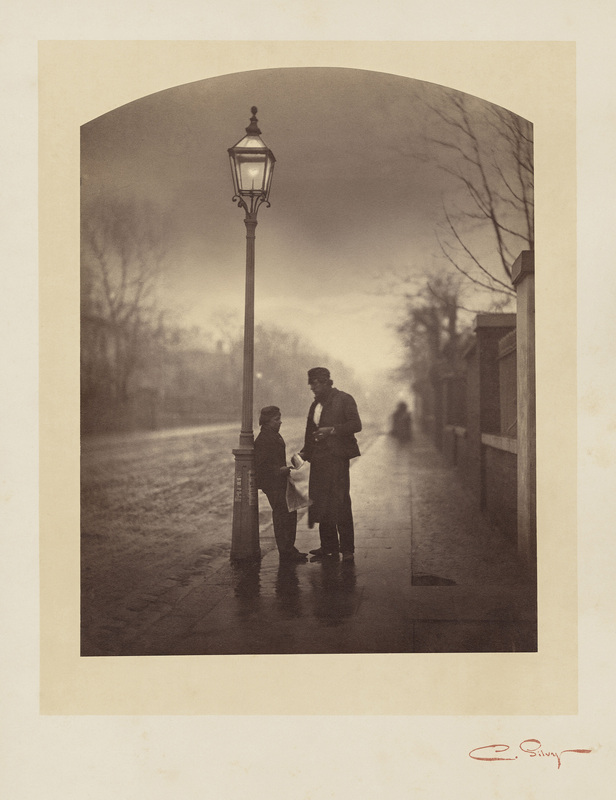 The exhibition – Camille Silvy: Photographer of Modern Life – at London’s National Portrait gallery, pays tribute to the life and work of a man who was London’s top society photographer in the 1860s, yet who disappeared from the city almost as suddenly as he arrived. Forgotten by all but a few experts and descendants, he is now the subject of a major exhibition which displays his works and methods in close detail. Born in the market town of Nogent-le-Rotrou near Chartres in 1834 to a prosperous local family, Silvy studied law and became a diplomat in the French foreign office on graduating at the age of only 18. Posted to London in 1854, he became friends with the photographer Leonida Caldesi who took his portrait using the wet collodion process which had been invented in England only three years before. The technique involved coating the glass negative in a silver salt solution. It was then developed immediately after exposure, making for both greater speed of production and clarity of picture. It was a technique Silvy was later to make his own. In 1857, Silvy was sent to Algeria to draw local scenes as part of a drive by France to entice more people to emigrate to the colony. It is estimated that 50,000 had done so between 1825 and 1847 but the settlers had found a great deal of local opposition and France wanted to boost their numbers and assume greater control of the country. Although Silvy had artistic talent, he took up his earlier hobby of photography instead, believing that it would more exactly depict the sites he was commissioned to record. 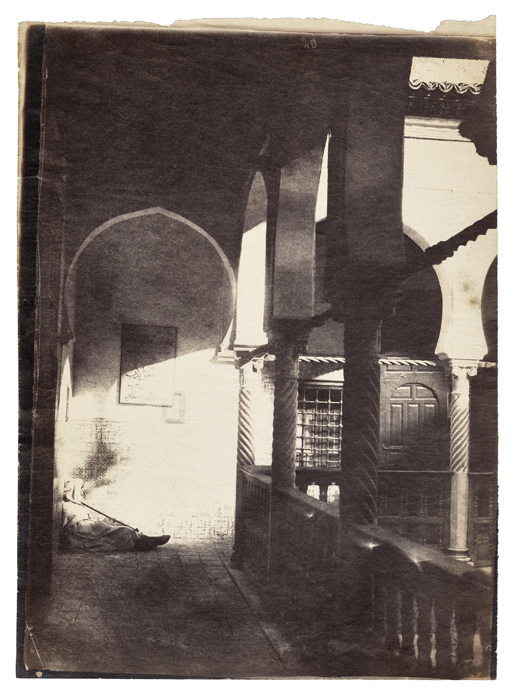 The exhibition displays two photos he took from this visit and one – Algiers:The hashish smoker on the balcony – is outstanding for its combination of light and shade and the discovery of the smoking man, quietly drawing on his pipe, tucked away near the bottom of the frame. Already, Silvy was demonstrating an original eye for composition and form, a true artistic sensibility. The Silvy family had meanwhile bought Gaillard, a farmhouse in a hamlet to the east of Nogent , where Silvy could indulge his photographic hobby, taking shots of picturesque rural scenes. 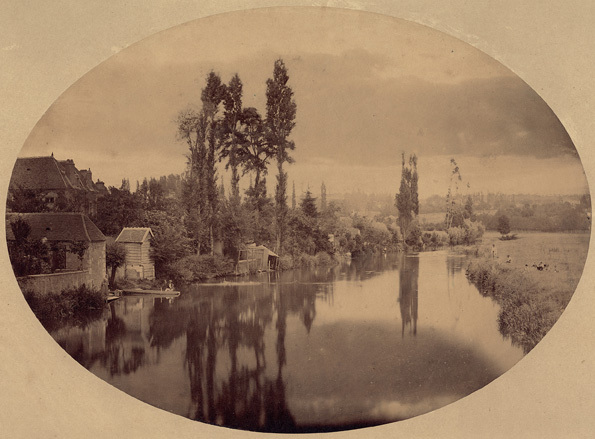 One of the most famous was River Scene, France of 1858. Later entitled La Vallée de l’Huisne after being displayed at a salon in Paris in 1859, it depicts a scene which was to become very familiar to later generations, especially through the eyes of the Impressionists. Leisure was becoming a dedicated pastime in the newly-industrialised France of the era. Greater job security and regular wages, coupled with more free time, had enabled people to enjoy themselves at rest and play. So here we see a couple on the left with the young woman about to board a small boat to be rowed along the river by her beau, while a family group of workers on the opposite bank relax and take in the scenery. Yet even here Silvy is seen to be a masterful manipulator of the image. Three different versions of the photo are known and the foreground is different in each. On one, Silvy drew a more ominous dark cloud overhead in the negative and created some trees in the centre left. It was no surprise that Silvy’s efforts had the salon critics singing his praises. Silvy was now a ‘rising star’ in the photographic firmament, as exhibition curator Mark Howarth-Booth puts it in his book accompanying the exhibition. In 1859 Silvy produced another of his early masterpieces. 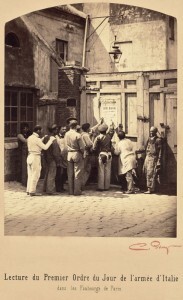 The photo depicts a group of Parisian workers – with perhaps the odd artist and intellectual thrown in – studying a poster relaying the First Order of the Day to the army of Napoleon III, then fighting in Italy. The Emperor, nephew of and heir to Bonaparte, was a dictatorial ruler of the French who exercised wide control of the media. It was therefore not surprising that he would wish to maintain this control even in his absence on the field of battle where he was attempting to expel the Austrians in order to attain Italian unification. This Ordre du Jour was drafted by the Emperor in Genoa on 12 May 1859. It was then sent by electric telegraph to Paris, printed overnight and displayed in the streets at dawn the next day. Silvy must have sensed something of the same for he re-staged the scene and the resulting photo sold well and was much admired at court. It was around this time that Silvy started to take an interest in cartes-de-visite, small calling cards with the bearer’s photo on them. They owed their origin to commercial cartes which were printed in multiples on card by the litho process then cut into single units. The photographer A A Disdéri had had experience of working with a litho printer and invented a process for reproducing small portrait photos in batches of six or eight on one negative. Just as today when different shots can be digitally selected from a computer, Disdéri would take several photos of a subject at one sitting and the best would be selected for the actual carte. He patented the process in 1854 and within five years cartes were de rigueur in France. 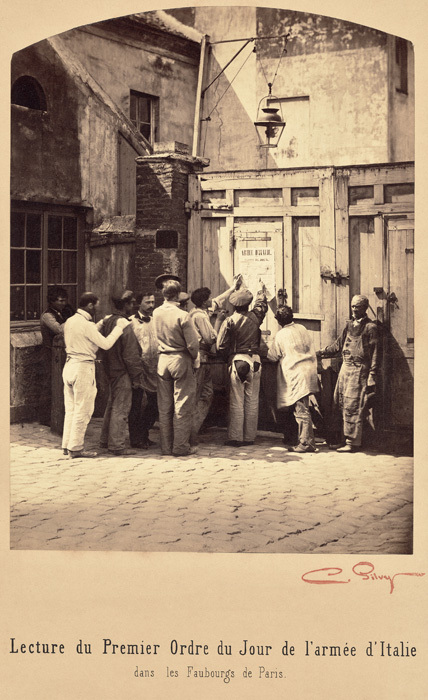 Silvy saw an opportunity to ally his great technical skill in photography with a means of making his fortune, but competition amongst cartes-de-visite photographers in Paris was fierce. So Silvy resigned his diplomatic post and decamped to London, a city with which he was familiar from his earlier posting. 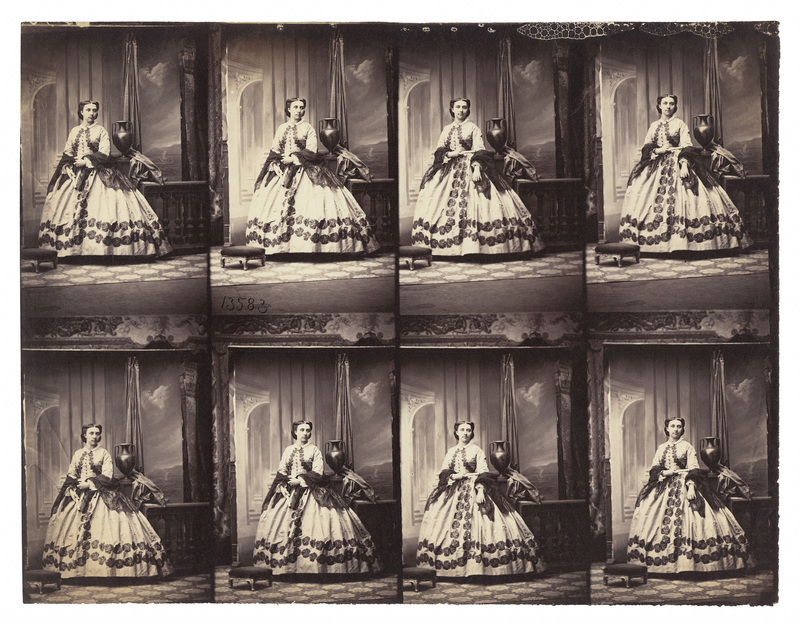 He bought an already- fashionable photographic studio in Bayswater and set up his business in the summer of 1859. 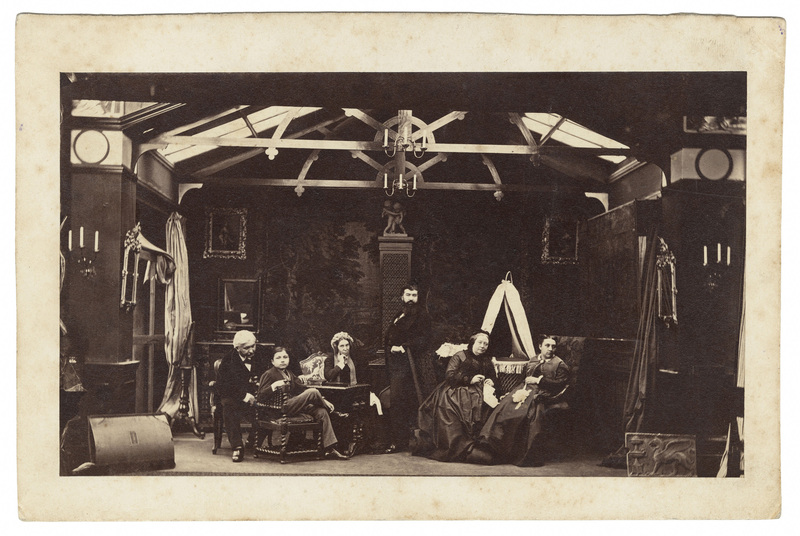 This studio, at 38 Porchester Terrace, was for the next nine years the scene of some of the most frenetic activity and inventive photography of the early Victorian age. The wet collodion process was still relatively new and its British inventor, Frederick Scott Archer, had failed to lodge a patent. So his invention was free for all to use and adapt. Silvy duly did this and turned what had been a high-class portrait business into a flourishing photo factory where industrial processes dominated. Silvy’s photos were distributed in their thousands through a firm in Regent Street. His was an exclusive business; sittings were expensive and only available to the wealthy.He charged three guineas a sitting plus half a guinea for each extra print ordered for full-size portraits. The charge was two guineas a sitting for forty cartes-de-visites shots. Further cartes could be ordered by the dozen. Converted to today’s prices a portrait sitting would cost £135, which may not seem a lot for a photographic session, but three guineas would have been beyond the means of all but the wealthiest in 1860. Indeed, Silvy’s daybooks from this period bear this out. They number twelve in all and were bought by the National Portrait Gallery in 1904 for £60. 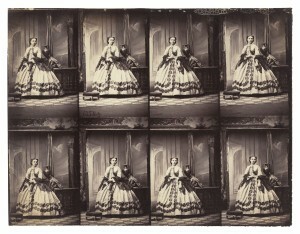 They record the workings of the studio, day-by-day, from the first photos taken in 1859 to the last in 1867. Françoise Monnier-Dominjon, a sprightly French lady now in her 80th year, is Camille Silvy’s great niece. On a recent visit to London she explained how her relative’s photographic collection survived to feature in collections around the world. “My great aunt Alice, Camille’s wife, was devoted to him and his work and it is thanks to her we have this legacy today,” she said. Although Alice kept her all husband’s work in order, the collection was sent to the attic of the family home in the Jura in the early 1900s when there was less interest in Silvy’s work, especially as he had disappeared from view into an asylum. “It was 1944 and our family home had been commandeered by General Andrei Vlasov and his men. He was a former Soviet Army commander who had gone over to the Nazis. His soldiers fought the local Resistance and carried out reprisal killings on the local populace. When Mme Monnier-Dominjon’s family returned to the family home after the war, it was in a terrible mess. She continues: “I was just a young girl when I started to explore upstairs, digging up family papers, letters, gathering Camille’s scattered photos. Every piece of paper was examined.” However, she found that the The Hashish Smoker had been screwed up into a ball so she spent successive summers flattening it under a heavy book. Now fully restored, it is on display at the National Portrait Gallery. For Mme. Monnier-Dominjon and Camille Silvy’s other descendants, seeing the London exhibition featuring their illustrious forebear is “a dream come true.” Now they are hoping that the exhibition moves to Paris where he can finally be honoured in the land of his birth. But how did Silvy achieve such a rapid entrée into London’s high society? He presumably had previous contacts from his diplomatic service in England and one such no doubt acted on his behalf. 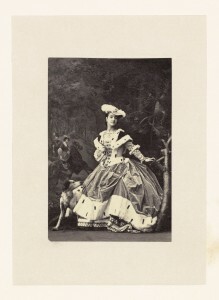 In December 1859, a neighbour and friend of Silvy’s, a fellow Frenchman and inventor called Joubert who had an interest in photography, had taken three of Silvy’s photos to show Queen Victoria and Prince Albert at Windsor Castle. These were his studies of light named Fog, Sun and Twilight, the last of which the royal couple had particularly liked. The Queen directed custom Silvy’s way, the first prominent sitter being Viscount Sydney, her Household Chamberlain, who was followed by a veritable torrent of nobility. In the first daybook alone appear three dukes, eight duchesses, three counts, 23 countesses, three marquises, eight marchionesses, ten viscounts, eight viscountesses, 32 lords (although none a-leaping) and 110 ladies. Twice as many women as men had their portraits taken. 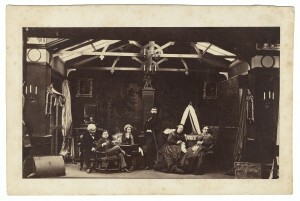 In June 1860 Silvy wrote to his father saying: ‘The Queen continues to send me all the people in her household, the first portraits that I made of them being very much appreciated.’ Silvy even set aside a special room in his studio reserved solely for the Queen should she ever visit for her portrait. It was furnished in Pugin’s Gothic revival style as seen in the recently-completed Houses of Parliament. However, although Prince Albert had his photo taken at the studio, the Queen herself never visited. Studies on Light: Twilight (1859) is perhaps Silvy’s masterpiece and proves how adept he would have been using Photoshop today. The photograph is a combination of different negatives in order to achieve an artistic whole. It has been shown that Silvy used one negative for the street lamp, another for the foggy background so typical of Victorian London, a third for the house wall on the right and a fourth for the man and boy. Haworth-Booth says that the ghostly figure walking along the pavement ‘is probably the first intentional use of blur in the history of photography.’ (Mark Haworth-Booth, Camille Silvy Photographer of Modern Life, NPG Publications, 2010). Haworth-Booth also highlights an intriguing link with a famous author, often said to be the father of the detective novel. ‘Silvy’s scene also conjures up the eerie world of Wilkie Collins…author of The Woman in White (1860). The novel, serialised from November 1859, [in Charles Dickens’s weekly publication All the year Round] opens with a twilight walk to north London. Collins lived as a boy at 30 Porchester Terrace – approximately where that uncanny blurred figure (male or female?) strolls or flees.’ This is just a few doors from Silvy’s studio outside which he set Twilight. And still Queen Victoria’s patronage continued. 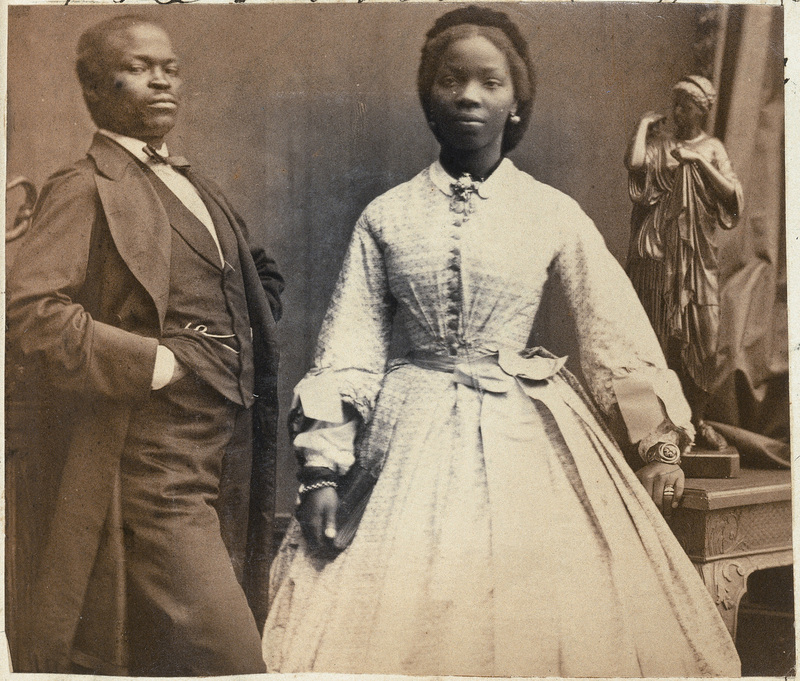 A series of wedding portraits were taken in 1862 of a couple, James Davies, a Nigerian merchant, and his new bride, Sarah Forbes Bonetta. 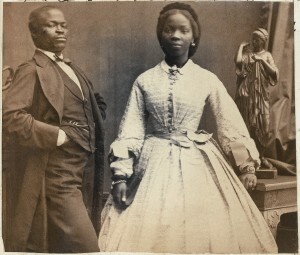 She had been found in a village in Dahomey (modern Benin) by a British sea captain, Frederick Forbes of the ship Bonetta. The daughter of a Yoruba chief, she had been captured two years earlier after a tribal massacre. Being of royal blood, she was not sold into slavery as was the custom but was destined for the more noble fate of ritual sacrifice. Forbes persuaded the local chief to give him to her as a gift so that he could present the girl to Queen Victoria – ‘from the King of the blacks to the Queen of the whites’ – as he put it. Queen Victoria took Sarah under her wing and oversaw her education, which was rapid, and her marriage to James Davies in Brighton. Haworth-Booth has discovered that the royal accounts show a payment of £3 for cartes of Mrs Davies and suggests it is likely the Queen also paid for the sittings. When Sarah died of tuberculosis in 1880, Queen Victoria wrote in her journal: ‘Saw poor Victoria Davies, my black grandchild, who learnt this morning of the death of her dear mother”. By now, Silvy had attained the photographic fame that the French critics had foretold three years earlier. By February 1862, his studio had produced more than 700,000 cartes and owned 363 printing frames. The factory-line process was emphasized by the fact that Silvy was photographing one portrait sitter every twelve minutes. Yet Silvy himself never regarded what he did as art but rather a reproductive process. Things were going well but there were signs of decline even amidst the success. In 1867, Silvy wrote of how he was suffering from ‘fatigue from the tedious work which is ruining my health’. He had often complained about London’s polluted atmosphere and it is also possible that his ill health owed something to his frequent contact with the chemicals used in the developing process, a problem recognised by doctors even at the time. 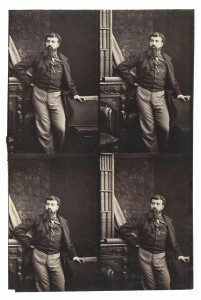 Cartes-de-visite also fell out of fashion and Silvy made his last portraits in 1867. His studio closed officially the following year but by then Silvy was leaving the work to his assistants. His business had contracted from 800 portraits a month to only 800 in the entire last year the studio was open. After its closure, Silvy was briefly vice-consul to the French government in Exeter. However, war with Prussia loomed in France and Silvy enlisted as a lieutenant. He was mentioned in dispatches in November 1870 and made Chevalier de la Légion d’Honneur the following month for saving two companies of men encircled by enemy forces. But the war was a brilliant interlude in Silvy’s decline. Around the age of forty he began to show signs of mental illness and was diagnosed as suffering from folie raisonnante, a delusional form of psychosis. Nowadays he would be classified as a manic depressive or suffering from a bipolar disorder. His mother cared for him but her death in 1874 had a terrible affect on Silvy. He started to spend money he didn’t have. He became convinced family members were acting against him and believed he was being cheated of his inheritance. He rented rooms which he never occupied, walked barefoot in the morning dew and swam in ponds as part of a self-prescribed health regime. This behaviour led to his incarceration for 18 months until he was deemed to have improved sufficiently for release. He struggled on for a further eight months until attending an old comrades’ reunion where he vehemently – too vehemently – defended the character of an absent fellow combatant. The argument descended into a fight and Silvy was arrested. He was examined in prison by a doctor who knew him and initially all seemed well. Silvy was calm but suddenly launched into a rant about ‘bastards’ and ‘prostitutes’ who were robbing him. The doctor immediately ordered him to be placed in a straitjacket and taken to an asylum. He was later transferred to St Maurice near Paris, the famous Charenton asylum, where he spent the final 31 years of his life, dying of bronco-pneumonia in February 1910, aged 75. He is buried, along with many other French luminaries, in Père Lachaise cemetery. Silvy’s widow, Alice, survived him by just two years. Mme. Monnier-Dominjon talks of them only having six years of normal married life together, but what years they were: mixing with the cream of English and French society, enjoying fabulous wealth and royal patronage and constantly held up as being symbols of Anglo-French success. Silvy’s may have been a star which shone relatively briefly, but it burned brightly while it did and left the legacy of his genius.